Getting a check is almost always a good thing. The only catch is that you can’t really spend money using somebody else’s check. Cashing a check is often free, but some places charge steep fees to convert a check to cash. That’s frustrating – and it means you’ve got less money. So where can you cash checks for free (or as little as possible)? Your best bet for free check cashing is any bank or credit union where you have an account. At most institutions, account holders are not charged for this service, and you can always just deposit the funds and withdraw cash later. Full amount? Depending on your bank’s “funds availability” policy and the type of check you’re cashing, you might not get access to the full value of the check – but getting $200 or so should not be a problem. No bank account? If you don’t have a bank account, it’s probably worth opening one. Living without a bank account is certainly possible, but it takes extra energy and creativity to live that way – it probably only makes sense if you can’t open an account for some reason. If you have a check in-hand (and especially if you expect to receive more checks in the future) you can always use that check to open your first account. Opening an account will most likely save you a lot of time and energy. Credit unions offer more locations: if you’re a member of a credit union, you might have more options than you think for cashing that check. There are thousands of shared branching locations throughout the country, which allow you to visit other credit unions (that you’re not a member of) to cash a check. Another option is to cash the check by taking it to the bank that the funds are drawn on. In other words, go to the bank where the person who wrote the check is an account holder. For example, if the check draws from an account at Bank of America, you can walk into a Bank of America branch and request cash. To find out which bank issued the check, look for the name of a bank or credit union on the face of your check. The only time you’ll have a hard time finding the bank’s name is if you’re dealing with a government-issued check. Although you can’t walk into the US Treasury for cash, you should find those checks easier to cash at banks and retail outlets because they are considered safe checks. It’s not always free to cash checks – even if you visit the bank that the funds will come from. Many banks charge fees to non-customers, so be sure to ask about fees before you proceed. If you can’t visit a branch of your checkwriter’s bank, you can try other banks (banks at which neither you nor the checkwriter have an account). However, you’ll be lucky to find anybody willing to cash a check, and you’ll be extremely lucky to get it done for free. You can always ask though. Some stores will cash checks for free, assuming you intend to spend some of that dough while you’re there. From their perspective, cashing checks is not the worst idea in the world – when you’ve got cash in your hand, you’re generally more willing to spend. However, they aren’t in the business of taking risks on bad checks, so don’t expect it to work every time. Your odds are best if you’re a regular customer and the staff is familiar with you. Plan to endorse the check or sign it over to the store to get cash. Some national stores offer free check cashing. Kmart stores cash checks at no charge if you’re a member of the Shop Your Way program. Walmart has also been known to cash checks for free – especially government-issued checks (such as stimulus checks and tax refunds) – and Walmart regularly cashes checks in their Money Centers for three dollars. It might not be free, but it’s pretty close. Grocery stores are another inexpensive option (typically around one dollar or so), and they might even cash small personal checks. Ask about check cashing at the customer service counter. If you don’t need the cash immediately, you can deposit your checks to a prepaid account (which is presumably linked to a prepaid debit card). You’ll be able to spend that money as soon as the check clears, and you might even have some the money available immediately, depending on the funds availability policy. You can eventually turn those funds into cash by making a withdrawal at an ATM. To make the deposit, you’ll use an app and snap a photo of the check with your mobile device. This is an especially good option if you can’t open a bank account. Prepaid cards can act as a substitute for fully-functioning accounts (although a plain-old account is probably best): you get to deposit checks, keep money safe, and spend with plastic. As you drive down busy streets, you’ll likely come across check cashing stores (which often share space with expensive payday loan shops). These places certainly cash checks – but it won’t be free. 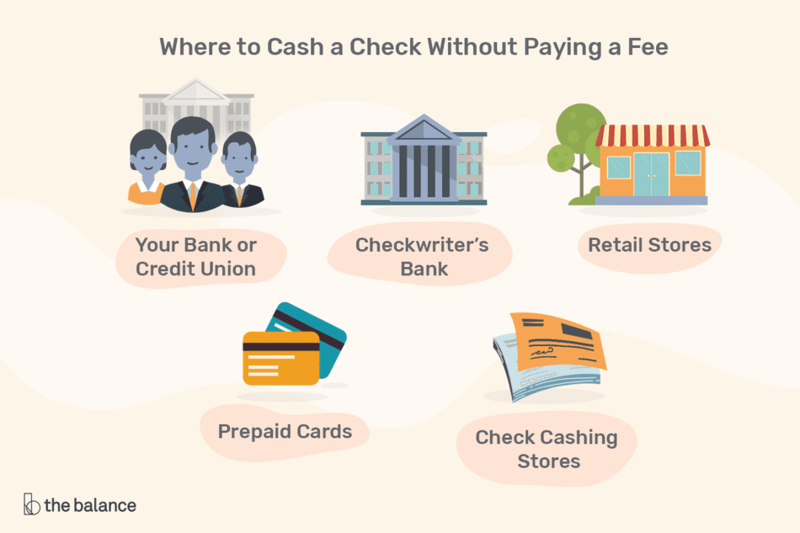 Check the fees carefully before you cash a check at a check cashing store. There’s a good chance that you can do better elsewhere. The type of check you have is important. Government-issued checks are best because they’re considered safe (less likely to bounce). That includes tax refunds, Social Security benefits, and other checks drawn on the US Treasury. Local government checks are also considered safe. Personal checks (with information hand-written as opposed to computer-printed) are considered the riskiest type of check to cash. You might be able to cash these if they’re relatively small, but you’ll pay more.